Bunraku is everything from blatant ripoff to experimental cinema to a graphic novel gone wild with its bad acting and predictable ending. Somewhere in the future, when comedians only do stand-up via Ipad, a joke will begin “So, a genre, some cliches and some performance art walk into a bar…” Until that deranged Jobsian future happens, we’re left with the Guy Moshe directed Bunraku. Long before the Muppets (four centuries to be precise), Bunraku was a form of Japanese puppetry where the puppeteers would be dressed in black, operating 4 foot tall puppets, while totally visible to the audience. There was someone who provided the music as well as a narrator who provided the voices for all of the characters in addition to narration. Puppets the size of an eight-year old does not a good movie make (and may get you sued by Henson’s heirs), so director Guy Moshe goes live action by cramming together every single genre, gimmick and cliche in the book. Set in a post apocalyptic world where knives and swords have replaced Smith & Wessons, comes Drifter (Josh Hartnett), straight out of Spaghetti Western 101 with a soft spoken demeanor and the fastest haymaker on screen. No sooner than he arrives at the nameless bar (in a nameless town) that he’s hustling the locals urban cowboys at a tavern ran by the sagely bartender known as “Bartender” (Woody Harrelson). Although everybody knows his name, this isn’t the Woody you remember from Cheers behind the bar. When he’s not slinging overpriced drinks, the slightly gimpy bartender plays with intricate homemade popup books. Keeping true to bartender mythos, he knows a little of everything that happens in the town, but is a bit reluctant to fight the power himself. Yoshi (the androgynous Japanese pop star Gackt) soon arrives sporting samurai garb, ponytail, a sword and a mysterious goal all his own. What binds these three heroes despite respectable character names? Well, in addition to a love of fighting, there’s the small matter of Nicola (Ron Perlaman) aka The Woodsman, the aging mob leader in this town. He rules with an iron fist which he uses to hold and throw axes to kill his enemies. Nicola hasn’t had to get his hands dirty lately, thanks to a group of 10 assassins led by Killer 2 (Kevin McKidd). Success has it’s drawbacks; however, a lesson learned by Nicola as he fails to keep a tight rein on his one true weakness Alexandra (Demi Moore). Although Bunraku pays tribute to an artform that’s over 400 years old, it borrows mercilessly from a countless number of cultural and cinematic archetypes that is challenging to watch most of the time and yet will leave you in awe how they managed to pull it all together. With a constant one dimensional graphic novel aspect, you expect to see the edges of set pieces or to see them fall down on actors at any moment. Scenes literally appear like a pop-up book with the dark colors and shading of a graphic novel. That’s just one of the annoyingly exciting things about Bunraku. The dialogue is as painfully cliched as the characters. Japanese samurai Yoshi seemingly strives for peace and acceptance of his father, but he’ll decapitate you in a heartbeat and Hartnett is a watered down parody of Eastwood with a mustache so fake that it looks like it was shaved from a coat. When you have a cowboy not allowed to use guns or ride a horse, it’s time to duck at the crap that may start flying any moment. For what it’s worth, his Drifter character is just as shallow as Yoshi, which in an odd way makes this work as a buddy film. 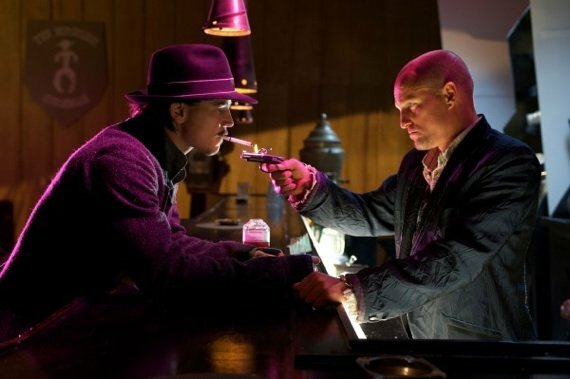 Woody Harrelson takes his barkeep role seriously, reminding his young comrades that “a hero isn’t always the strongest man. Sometimes its just the guy who leads the way.” The advice comes in handy when the duo of Yoshi and Drifter take on Killer 2, played with comic book delight by Kevin McKidd. And then there’s the violence. From a choreographed opening fight scene that will bring to mind more Broadway musical than The Big Brawl, violence is what passes for plot here. Moshe’s dystopic future sets guns and bombs aside, leading good old-fashioned hand to hand or knife to chest as the ways to communicate whether with friends, lovers or enemies. There’s even a fight scene reminiscent of Donkey Kong. It’s ironic that with all the fight scenes, the payoff with the evil Nicola is extremely underwhelming. Bunraku is everything from blatant ripoff to experimental cinema to a graphic novel gone wild with its dark colored lighting, bad acting and predictable ending. However, the only thing that’s as brave as the characters was the effort it took to even try it. In a time where Hollywood covers up its insecurity with remakes and reboots, experimentation often deserves a tip of the hat, even when it fails to hit the mark.